June Elaine Forsha, born on May 21, 1926, passed from this life to the next in Millersburg, Ohio on Saturday, August 4, 2018, after a period of declining health. She was 92 years old. June was born in Pittsburgh, Pennsylvania, and was the firstborn of three children. She provided much of the care for her younger brothers, Robert Edward (Bob) and Edward Robert II (Pepper). June’s father, Edward Robert Brame died in 1975, her brother Bob died in 1977 and her mother, Hermine (Minnie) Augusta Dingle Brame died in 2000. She also suffered the loss of her first daughter, Lynn, and she never stopped missing her maternal grandparents, Jacob and Hermine (Reugger) Dingle. June married Eugene (Gene) Roy Forsha in 1947 and the family, including children Richard, Jeanne (Terry) Peterson, Charmaine (Kim) Kellogg and Jacci (Roy) Thomas lived in Pittsburgh. In 1956 they moved to Lakewood, Ohio where sons Douglas (Rhonda) and James (Giseli) were born. The next move was to Medina, Ohio in 1961 where her last child, Jeffrey (Carlena), was born. During her time in Ohio, June worked in direct and retail sales, and then managed a Lawson’s store in nearby Brunswick. In 1970 the family moved to Phoenix, Arizona. June and Gene divorced in 1983; Gene died in 1996. In Arizona June worked in retail sales, before transitioning to the Arizona Department of Revenue where she regularly earned achievement awards. June retired as a supervisor in the Department in the mid-90s, but she missed working so she found a part time job, and then retired for good when she was 72 years old. 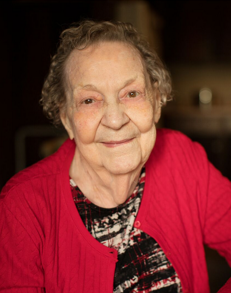 In her day June loved to read, was a keen card and game player, nurtured indoor and outdoor plants and occasionally dabbled in needlepoint and other crafts. Always she adored and doted on her companion dogs, especially her miniature schnauzers Katy and Lexi. Being strong-willed and independent, June overcame many adversities with determination and resolve. She lived on her own in Sun City, Arizona until age 89 when she moved in with daughter Jacci Thomas and great-granddaughter Chevelle Thomas. This was a comfortable move for June as Jacci had faithfully provided companionship and loving care for her for many years. June developed a close bond with great-granddaughter Chevelle who called her “GG.” Chevelle entertained GG with singing, dancing, acting and doing gymnastics. She helped GG when she needed assistance, spoke loudly when her hearing diminished and quietly “tattled” when GG took off without her walker (which was often). June frequently asked after “that little girl” and when Chevelle danced for her one last time just four days before her death, GG swayed with the music, smiled broadly and clapped enthusiastically. Though she had vowed to never return to Ohio in the winter, she did so in December 2017 and lived with daughter and son-in-law, Char and Kim Kellogg, in Millersburg, Ohio for the last eight months of her life. June loved the peaceful rolling hills of Holmes County and enjoyed sitting by the window or on the front porch (only if it was at least 90 degrees) with the family pets admiring the beautiful views and watching the Amish neighbors go by in their horse-drawn buggies. The house was very often filled with her favorite songs and her dry wit was always entertaining. Kim and Char felt very blessed to have her share their home. The difficulties of the last few days of June’s life were made more tolerable by the compassion and skills of the caring doctors, nurses and aides in the ER and on the third floor of Pomerene Hospital in Millersburg. In addition, the staff of LifeCare Hospice provided generous and sensitive support from intake to the end of life. Their direction and experience enabled a pain-free and peaceful passing for June and helped family members bear the unbearable. The family is grateful too that the staff at Alexander Funeral Home was there to guide the family kindly and deftly through the end-of-life details that supported June’s wishes of cremation. The family expresses thanks to all who cared and prayed for June and the family. Your presence, prayers and support were strengthening. May God bless you!